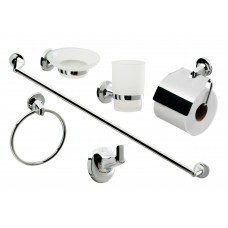 A modern chrome effect wall mounted bathroom accessories set, bringing stylish design to your bathroom. Supplied with fixings (screws and wall plugs). Consists of a towel ring, towel rail, soap dish, tumbler, toilet roll holder and robe hook. The Modern Simplistic 6 piece bathroom accessory set is the perfect solution to creating a stunning and practical environment in your bathroom. They are ideal for giving the space a sleek and stylish look. Give your bathroom the finishing touches with this incredible value accessory set.